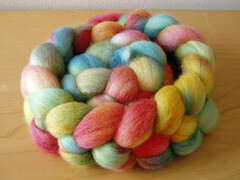 Last night I added several new items to the shop: handdyed locks! There are two breeds, Cotswold and Lincoln. Keep reading for more details on these breeds. While we were at the Farmparks Woolfest (Kirtland, OH) in June, I picked up about a pound of Lincoln locks from their fleece sale. Each year they shear their sheep and offer the fleeces at awesome prices. Since I had everything out for Dye Day already, I stuffed those into my crock pot and finished them up in a hurry. 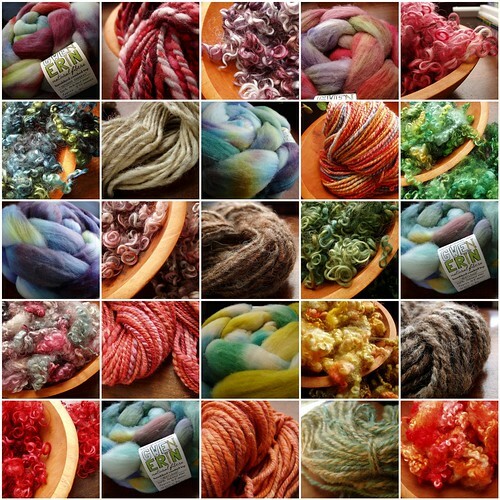 They took the dyes nicely and kept their wave – great for novelty yarns! In October Rich and I spent a beautiful weekend at the New York Sheep & Wool Festival in Rhinebeck, NY for our 2nd wedding anniversary. 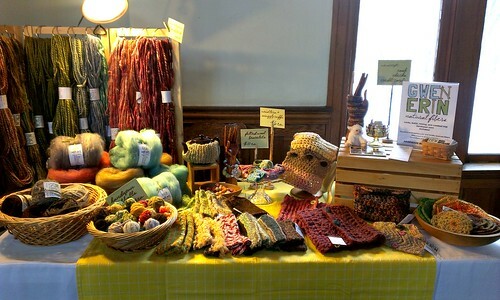 I checked out the fleece competition sale for the first time and found it well organized and well stocked. 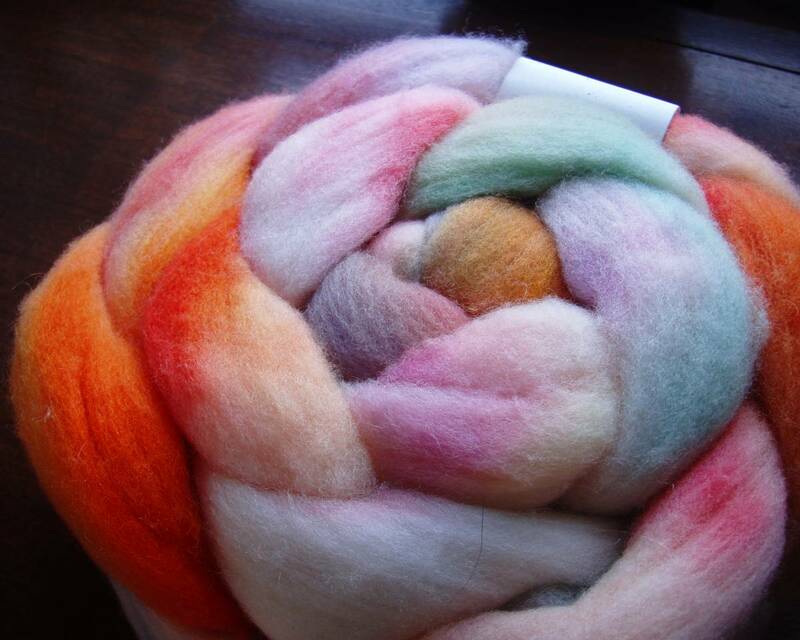 I went looking for a few nice medium and longwool fleeces, avoiding everything on the fine tables. 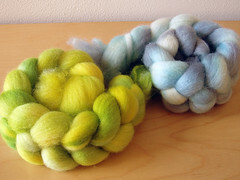 In the end I selected a gorgeous Corriedale/Lincoln cross and a Cotswold. 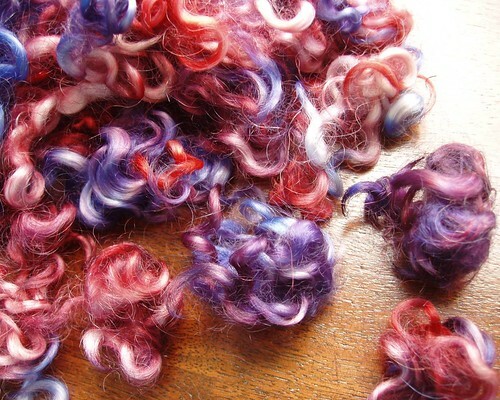 The latter I picked specifically because it had great wave and curl, so I thought they’d be perfect for dyed locks. And they are! 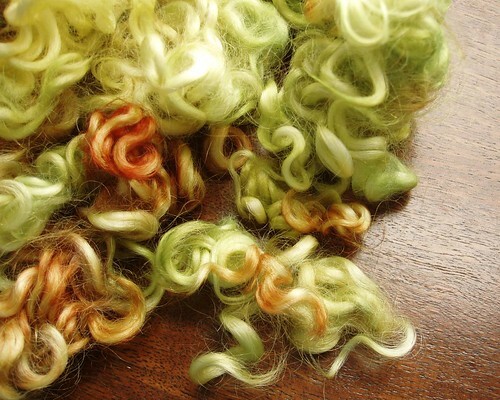 The colors are so vibrant and rich and the locks are so well defined, you might find it difficult to work them into your project. There’s nothing wrong with a bowl full of locks. I’ll bet it would make a great conversation piece sitting on your coffee table. Believe it or not, friends, I have new listings at my shop. 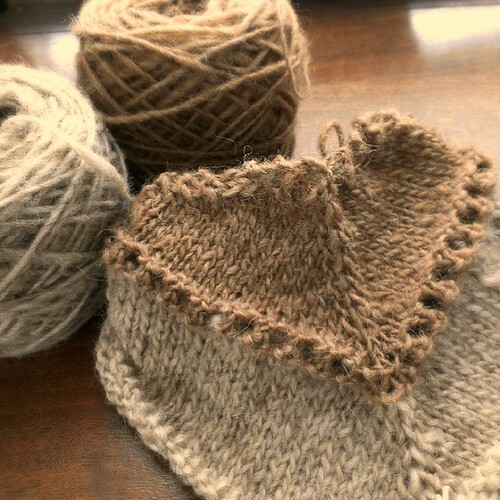 You remember those fibers I showed you two weeks ago? 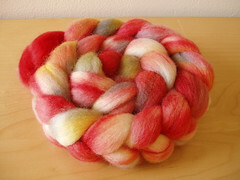 Well, all the Falkland and Romney are available for you to purchase. Go get them before they’re gone. Remember, each item is dyed individually in my kitchen. So no two are ever exactly alike. It’s happening in just less than two months. I’m glad I’ve had this time to mentally prepare and whatnot. Pennsic was a bit of a road block to a lot of our preparations, but with that out of the way, we’ve moved forward successfully. The day after we returned home from Pennsic, we spent the entire day rearranging the furniture in Rich’s apartment. He takes his couch/futon to camp, so we wanted to take advantage of the living room being mostly empty. We’ve made room for some of my furniture which consists only of one chair, a coffee table, and spinning wheels. As for planning the wedding itself, we had nearly everything taken care of before Pennsic except for a photographer. It was really difficult to find someone who was available and affordable. I didn’t think we’d get out without spending at least $1,000. However, through the grapevine, we reconnected with someone I knew from high school. She actually remembered me from when she worked there. We’re going to have a video done too, which I hadn’t considered before. And in a week or so we’ll meet with the caterer to discuss menu and cake! Also, I purchased an overnight carrying case to use as a card box from [Great Lakes Vintage], another Etsy shop. It’s actually a lot bigger than I had anticipated, even though I had a measuring tape in from of me at time of purchase. At the end of the night, I can just close the box and take it home! 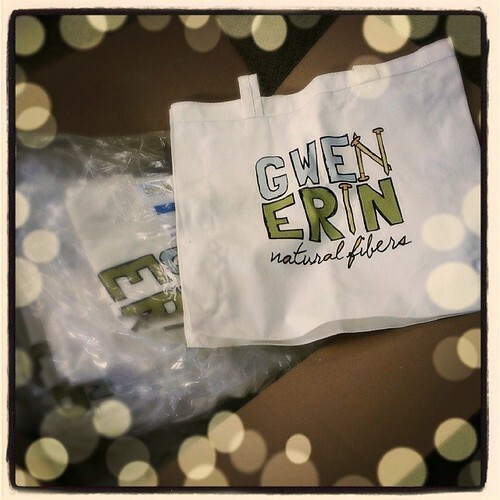 And then it’s reusable later. I’m not into this single-purpose-chatchka-lying-around-the house business. I’m trying to get a significant amount of dyeing done before I go away in a week and a half, but I can only handle about a pound at a time. 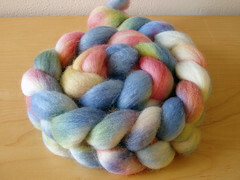 So I got out the remaining Corriedale and dyed it on Monday. 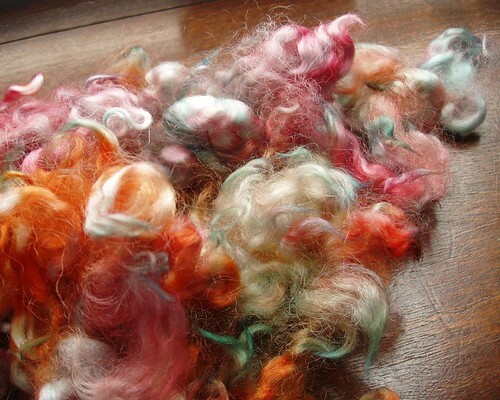 I’ve really taken to the whatever-it’s-called method where I soak the fiber, lay it out in a large rectangular casserole dish, pour the dyes all over the fiber and bake it in the oven. The colors don’t mash together as much so I get more variation. 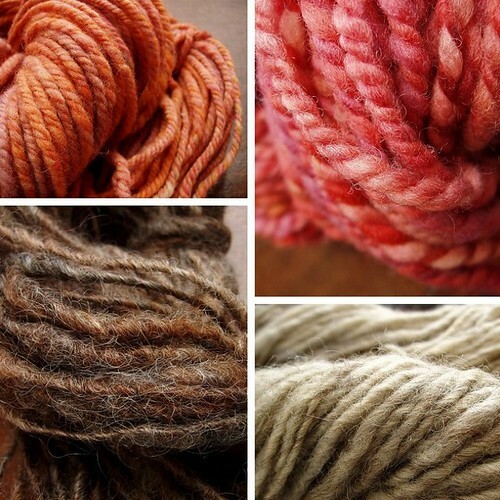 All of the following were dyed in that way. My favorites are the top two, Crab Nebula (first in the Hubble’s Eye in Space series [HubbleSite.org]) and Heat Miser. The green/blue one is called Surf and Turf; each is 2 ounces. My original thought was to spin each as a single and ply them together. The last is unnamed because I am not inspired by it. I think I’m going to spin it and go from there. The other three are for sale. 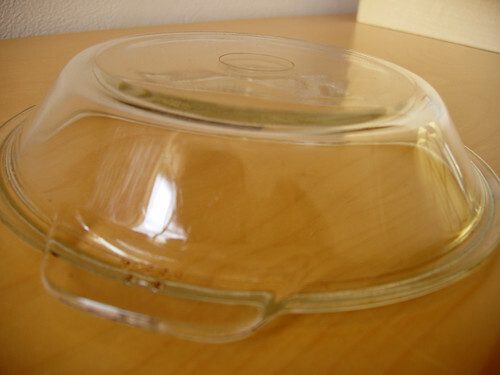 My mom has started a Pyrex lid collection for me. She brought home three lids and an adorable 6″ pie plate from the thrift store yesterday. I didn’t even know they made those! It’s so small and cute. Two of the lids I know what their bottoms are, but the third is very unusual; I’ve never seen it with anything before. It’s identification is as follows: B – B 682 C. Anyone know anything about it?